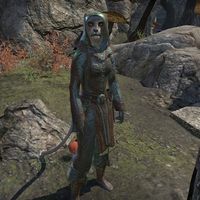 This article is about the Khajiit on Eyevea. For the Redguard at Rahni'Za, see Fada at-Glina. For the Khajiit in Longhaven, see Fada-daro. Fada is a Khajiit member of the Mages Guild found on the island of Eyevea. She is found just east of the Mages Guild Hall, before the bridge. She is busy interacting with Vivien Dutil and won't speak to you, nor does she have any unique dialogue. This page was last modified on 9 February 2019, at 00:35.